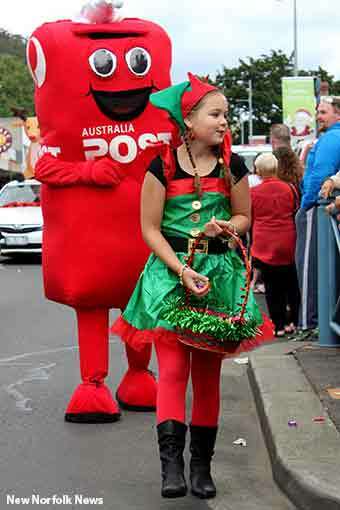 TODAY'S New Norfolk Christmas Parade was turned on its head and ran in the opposite direction to previous years, starting near the police station and proceeding to Circle St before making a return trip down High St.
A big crowd turned out in the reasonably cool weather to watch the parade which this year had 29 entries. Organised by the Derwent Valley Rotary Club on behalf of the New Norfolk Business Alliance, the parade was broadcast live on community radio station Tyga FM, with station manager Roz Chapman and Craig Farrell MLC giving a running commentary. Santa Claus made two laps of High St before heading to Arthur Square where the Rotary Club was staging a Christmas fair. The judging panel of Senator Jacqui Lambie, Lyons MHR Brian Mitchell, Lyons MHA Guy Barnett and Derwent Valley mayor Martyn Evans named Glenora District School as having the best presentation in the parade, followed by Fairview Primary School and the Derwent Valley Child and the New Norfolk Christian Leaders Association. * Sorry about the speed of this slideshow. It is unable to be slowed.